Her phone is her link to friends and the wider world, and those modern realities are celebrated in the blond female with smart phone personalized Christmas ornament from Russell Rhodes. 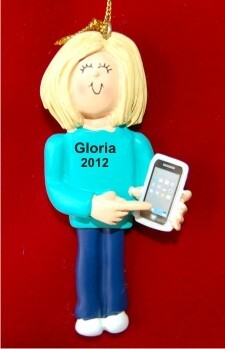 These adorably designed kids ornaments personalized by hand feature her name and year on the front. We'll add a custom message on the back at your option before shipping the blonde girl with smart phone personalized Christmas ornament in our custom velvet gift pouch.